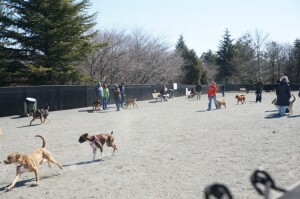 Reston Association wants to know how you feel about Reston’s Dog Park at Baron Cameron Park. The RA Board of Directors will be discussing the dog park — as well as listening to comments from members during its regular monthly meeting on Thursday, March 24. The dog park discussion will begin at 7:30 p.m. RA has no particular motion for action to be taken concerning the park. At issue: the ongoing saga of nearby homeowners who say their quality of life is being interrupted by the constant barking and yapping from the off-leash area that borders Wiehle Avenue. The RA board recently received a petition from residents of more than 40 homes in Longwood Grove, located across Wiehle from the park. While RA can listen to members and discuss the matter with the Fairfax County Park Authority, it likely does not hold any authority as the off-leash dog area sits in Baron Cameron Park, which is owned by the park authority. Park Authority representatives have also been invited to speak at the meeting. The Longwood Grove residents are asking RA’s help in addressing the following issues: the nuisance noise coming from the dog park, traffic concerns at access points to the dog park, proper management of the facility and its users, and relocation of the park to Lake Fairfax. FCPA Chair Bill Bouie, a Reston resident, says the park authority has taken steps to mitigate noise — but there will always be some noise with a dog run. “Balancing the needs of pet owners and those who live near any of the Park Authority’s nine Off-Leash Dog Areas is a challenge,” he wrote to the RA Board. “Regardless of any rules or restrictions at our facilities, there will be the barking of dogs in general — such noise is a characteristic of dog parks. In fact, noise is a factor in many recreational areas. Some of the measures include noise-reducing fencing material and altering park hours to be in line with Fairfax County’s new noise ordinance. Bouie said the park authority has no funding or plans to move the park to Lake Fairfax. The noise complaints about the dog park have been going on for many years. The dog park has been at the Wiehle Avenue edge of Baron Cameron Park since 2001. The residents say the off-leash area, which is the only one in Reston, was supposed to be temporary and was never approved by the county planning commission. A smaller group of Longwood Grove owners recently lobbied for the dog run to move to Lake Fairfax Park, even offering the park authority $15,000 to assist the process. The group also filed a lawsuit against the county park authority and the former nonprofit that administered the dog park in order to get the dog run shut down. The lawsuit was dismissed last year, but the homeowners still want the park to move or to go away.